The Romantic painter Eugene Delacroix said the best thing a painter could do is cleanse the eye. There are two ways to do that: change the venue, or look at the work of other painters. This past week I had the privilege of doing both. 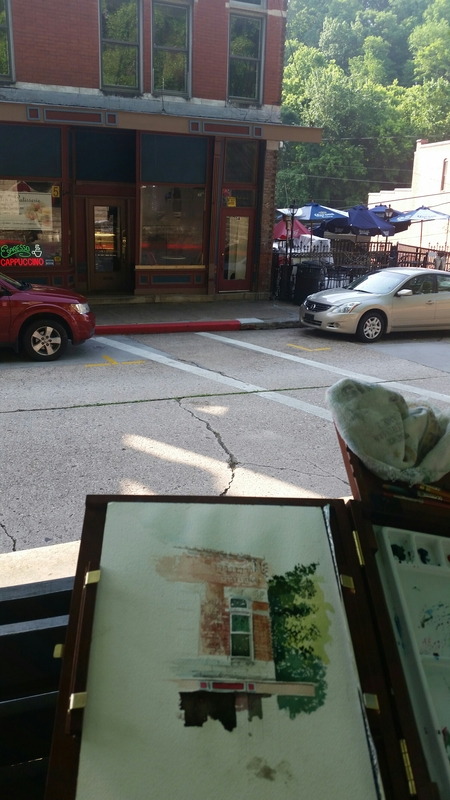 I strolled the streets of Eureka Springs, a city I have come to love intimately, and I got to look over the shoulders of painters at their easels, watching each one create a world through his or her own eyes, and translate it to a two-dimensional surface. Judges usually do not like the work of judging, because of the pressure of separating out a few winners from a large, magnificent body of work. But I am happy to do it, because I am given two hours alone with the art to breathe the sweetness of its atmosphere. 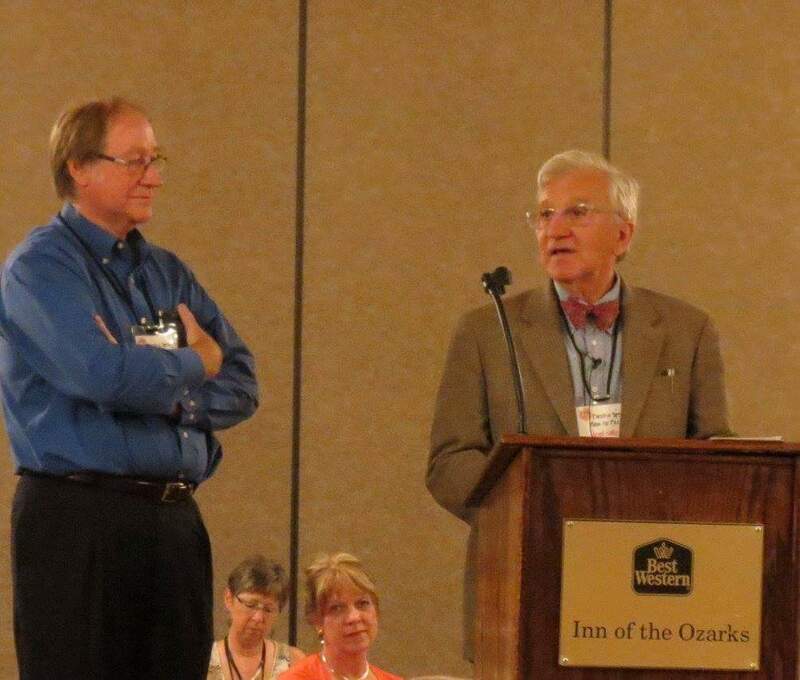 “Eureka” is Greek for discovery, and I am confident that all of you this week have experienced epiphany. I am glad to know that your renewed vision will continue to put the art out there, and make our good world even better. For that I thank you. Rising at 6 a.m., I was greeted by a nice cool Arkansas morning. I was delighted to have some time to get to Basin Springs Park before the workshop participants arrived so I could scout the place, looking for a subject to paint. Other plein air painters were already on site working hard at their craft. Finally I decided on this storefront, and sketched it in before the students arrived. My demonstration did not go as well as I wanted it to, but I knew that once the students began painting, I could return to it and tweak it as much as I needed, and get it to looking more the way I wanted it to look. I have decided to leave it as is, and begin looking for my next subject. Breaking down the weekend festival on Sunday night made rising early Monday to drive six hours to Eureka Springs an arduous task. I’m glad that I had no responsibilities when I arrived late on Monday. My first working day in Eureka Springs today involved a drive out of town to find Beaver Bluffs. I’ll be conducting my first workshop on these premises tomorrow afternoon. The directions given were good, and a stiff hike around the lake brought me face to face with towering bluffs and cedars shooting out of their crowns. I still haven’t solved the problem of watercoloring cedar trees, and I so love their appearance. The colors elude me as do the foliage patterns, though I feel I am getting the hang of the colors of the twisted trunks and branches. The striations in the rocky surfaces below the cedars revealed some interesting compositional patterns, and I was sorry I didn’t have time for a second one today. Perhaps tomorrow I’ll get a second shot at this scene, either before or after the workshop. It has been a long day, and tomorrow will be longer, so I must call it a night. You enter the raw edge of your mind; the naked line between you and your surroundings drops away. Whoever you are or think you are cracks off. The final day of an art festival always finds me tired and seated in the shade, looking for a subject to sketch. Reading Natalie Goldberg put me in a quality state of mind (I absolutely love writers with a Buddhist core), and looking up from my book at the tree in front of my booth, I could not help but gaze at the bark textures and twisting, serpentine lines of the grain. Alas, I had no pencil. But I decided to give it a try anyway, with a ballpoint pen. Within minutes, I was absorbed into the tree, and it no longer mattered that the Sunday-morning crowd was thin. 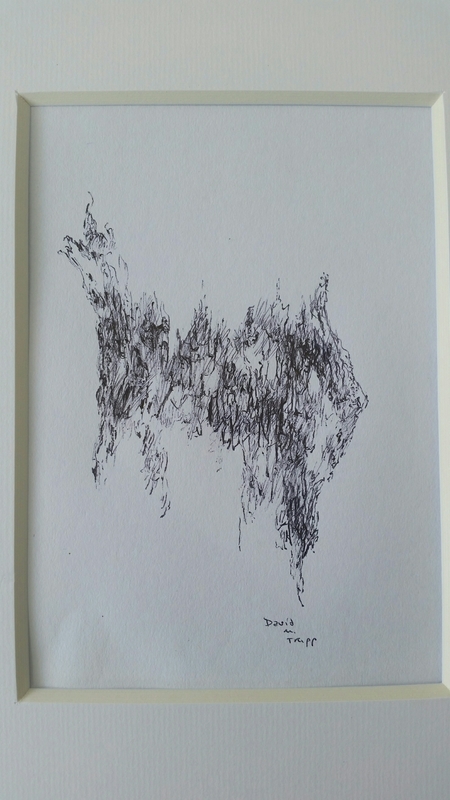 As a student of art history, I have read of the form-creating possibilities of line when drawing with ink, but I have experimented so little myself with it. The morning has been sweet with this quiet space for drawing. I draw in order to learn. 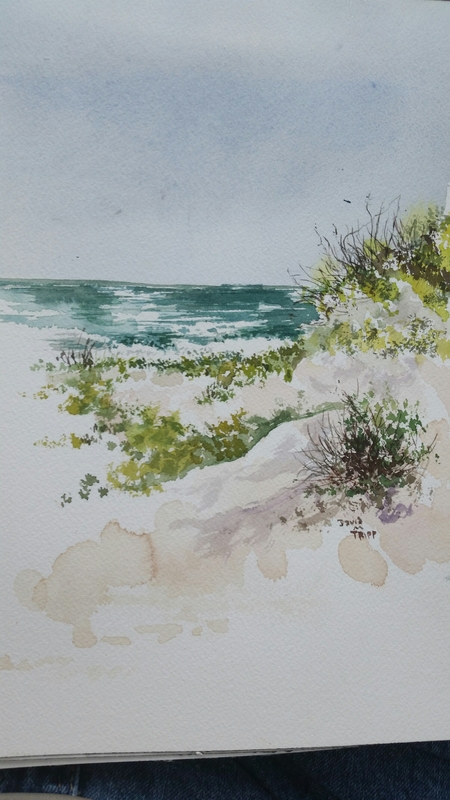 The weekend plein air escape has been a respite-my only pause in the midst of a string of workshops and art festivals. While gazing on this stretch of sand dunes along the Gulf yesterday, I tried to solve the colors of the greenery and dried stalks spiking up out of them. 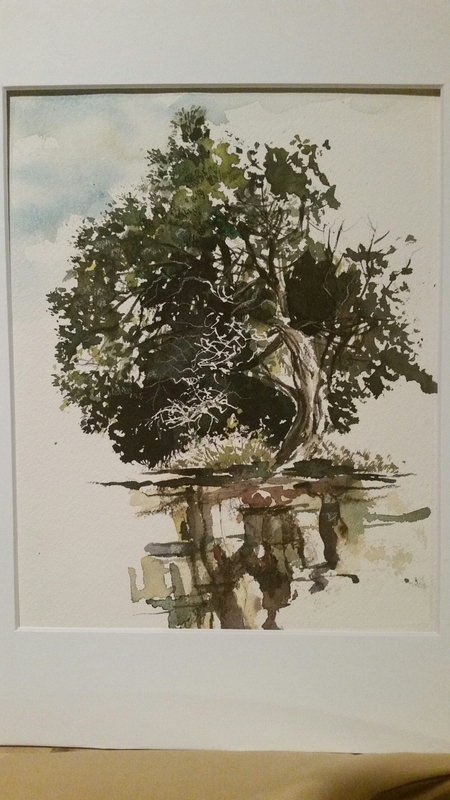 Part of me wants to cut this loose (I’ve already signed it), and yet another part wishes to take out a liner brush and do some dark green-to-black calligraphy in the midst of my greenery, as I did frequently on the island last summer. I’m delighted that I’ll get to return to the Laguna Madre in a few weeks, as I’ll miss this coastal area when I leave today. One excellent part of this weekend escape has been trying out for the first time my Sienna pochade box and MeFoto RoadTrip tripod. They worked magnificently, and I didn’t miss my battered, fragile duct-taped Winsor & Newton plein air easel. The latter had served its purpose, accompanying me on countless excursions throughout the years, and paying for itself many times over. But it was well past time to retire it with honors. It’s raining cats and dogs on the coast now, so there won’t be any painting today. Unfortunately I still have a long, long drive home. I knew I only had Saturday to paint on the coast, with it being such a long drive. 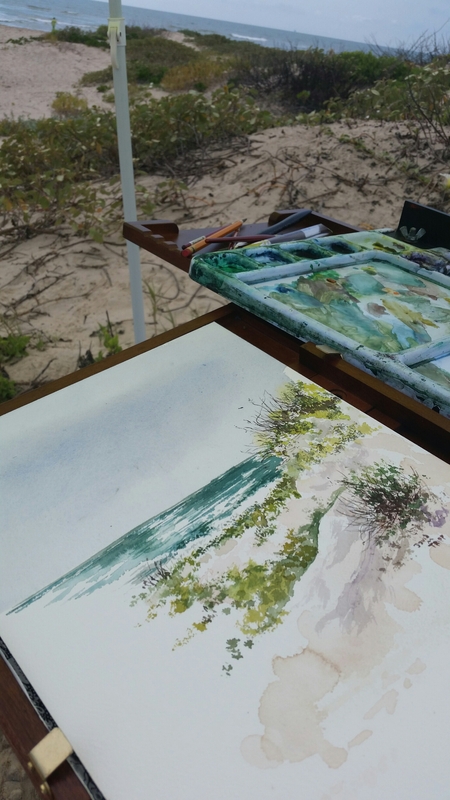 But I decided I needed to try out my new plein air easel, and wanted to look closely at the Gulf of Mexico and sand dunes. I’m happy with my first try, though the sun got hotter than I desired. Embarking on my 7.5 hour drive home would fill me with a state of sadness were it not for the blessed fact that I’ll return in 2 weeks to Eureka Springs, Arkansas for another week of plein air painting. The clear, warm light of the Arkansas sun on this Mother’s Day morning is lighting up the day like no other. So my shift today is from Thoreau’s Walden to Kerouac’s On the Road, driving through Arkansas’s mountains and listening to the sweet guitar stains of Michael Hedges. I’m grateful to savor this day and last week’s memories. Time is but the stream I go a-fishing in. I drink at it; but while I drink I see the sandy bottom and detect how shallow it is. It’s thin current slides away, but eternity remains. Today I had the formidable task of judging the works in oil, watercolor and pastel created throughout this past week. 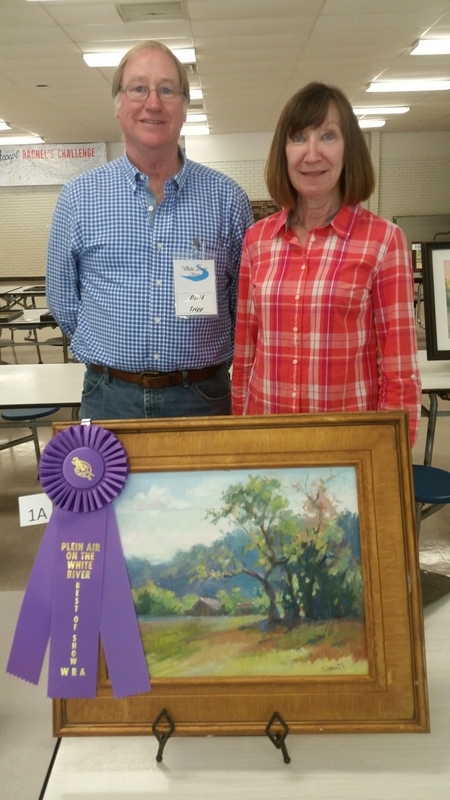 I have posted above the Best of Show winner Susan Hurst with her exquisite oil landscape. The cool, atmospheric colors of her distant hills along with those fabulous warm colors in the foreground took my breath away. I should be taking plein air lessons from her. I found her to be a precious soul when we got to chat after the judging. It always bothers me that I don’t get to spend quality time bonding with these artists throughout the week, but playing the role of judge, I feel that they need to be free of my presence, and certainly should not feel that I am hovering about their easels as they create. So, I remain as incognito as possible, finally stepping into their circle to talk frankly once the judging is done. I’m glad I finally got to talk at length with Susan, with Marty Coulter (who won last night’s Quick Draw competition along with today’s first place in works on canvas), and Lorraine McFarland (featured below). I also got to meet over a dozen other artists during this afternoon’s gathering. Below, I have posted the winner of the works on paper category, Lorraine McFarland, with her pastel landscape. In talking with her afterward, I learned a great deal about underpainting pastel works with watercolor, and the different looks created by soft, buttery pastels scumbled over the hard ones. 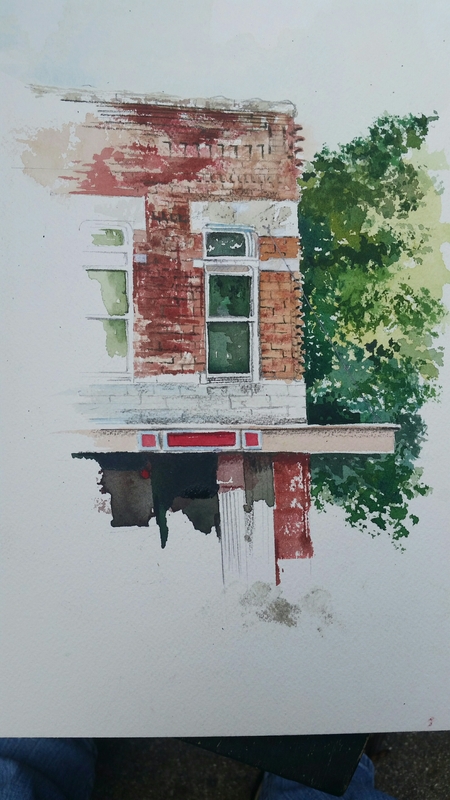 I am delighted to learn that Lorraine, along with one and possible two of the other artists, will be attending the week-long Eureka Springs plein air event coming up in just a few weeks. I will be there as well. What a reunion! For years I have loved the camaraderie of fellow festival artists as we see each other annually at art festivals that mean so much to us. But this will be the first time in a few years that I have gotten to bond with other plein air artists at such events. Before leaving Cotter, I just had to post this adorable photo I took of a ground hog munching bread right outside my cafe window a few days ago. He ate so much, that he eventually had to sit while eating, and then recline as he continued to eat! I laughed so hard, taking as many pictures as I could. This one is my favorite. I don’t know what else to add, but to say Thank You to the White River Artists, especially the officers of the organization, for making my stay so delightful, and for providing such a rich forum for these plein air painters to pursue their passions. The week has been so enriching to my soul, and I love every one of you. And thanks to all of you who take time to read these words. I paint in order to find myself. My friend Bill Barksdale picked me up again at six this morning to spend one more day on the river. Again, the weather was magnificent and the water had beautiful clarity. As for the fly fishing, I did not manage to land any brown trout, but I certainly sent many of them scurrying for cover. My responsibilities today were to judge the Quick Draw event which was held this evening. I’m posting the winner today, a gorgeous oil that was done in under 90 minutes en plein air. This is an amazing group of artists, and tomorrow’s judging of all the work done this week will be more formidable than today’s Quick Draw event. Thanks for reading. 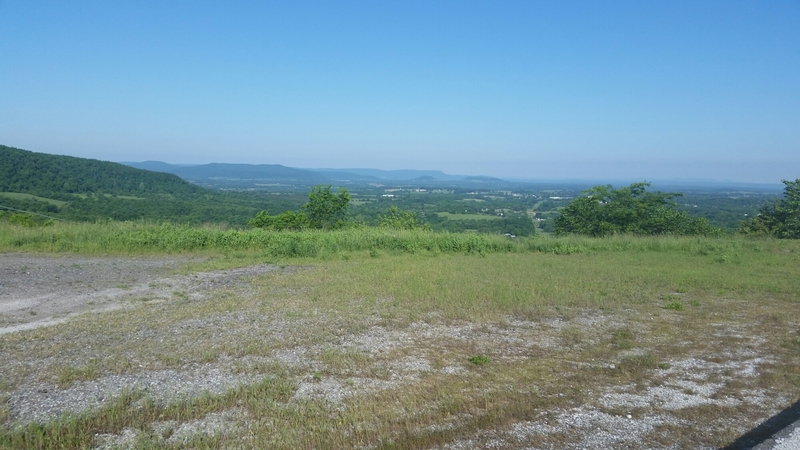 It’s been another remarkable day in Cotter, Arkansas.